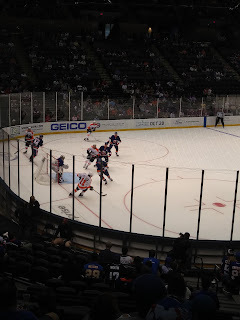 Well, it looks like hell hath frozen over; I attended an Islanders game. 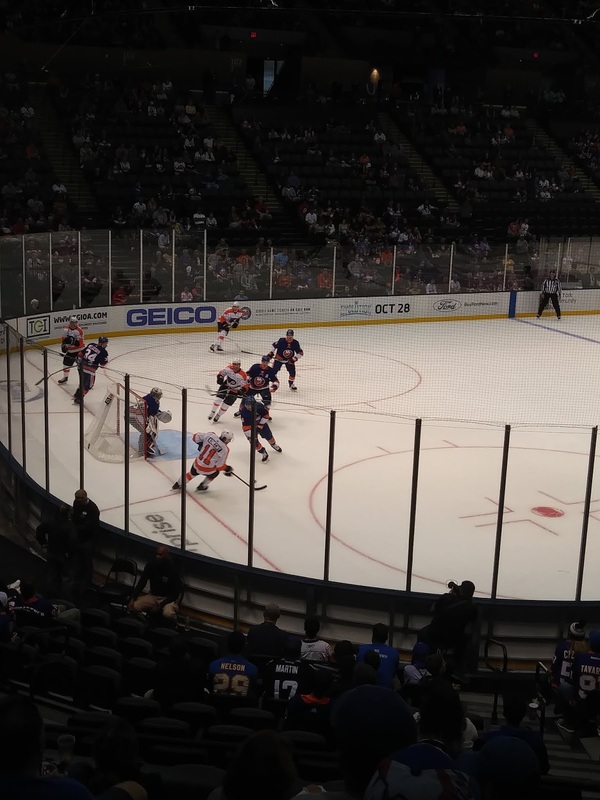 Okay, so it was a pre-season game and it was at the Coliseum, but I went. It was rather spur of the moment and something my spouse wanted to do more than I did, but that doesn't matter. I WAS IN THE BUILDING!!! So I have to ask, where were so many of you? I know I have been MIA for almost two years now, but I thought for sure the first game back at the Coliseum would be packed. While it was a "decent" showing for an 80 degree sunny Sunday, and 1 pm game, I was disappointed. This was the first time I have seen the renovations of the Coliseum for myself. I am still not a fan of the metal fence, space ship exterior, but the interior was clean and sleek. The bathrooms were a huge improvement and we finally have cup-holders. Yeah!! The dark gray seats are comfortable and the floor is freshly painted and isn't even sticky. The parking was a whopping $25, Big Pretzels are now $7 each, Wine is $11 for a 6 oz bottle and a cocktail is $13.50. Bring cash. Lots of cash. Granted, these prices are all in line with other venues, but personally I won't be able to do this too often. But that's my problem, not yours. While the original charm of the old barn may be gone, the amazing sight lines and acoustics are still there. So was the sweet, familiar sound of Paul Cartier's Hammond organ perched high above the ice. It would not be an Islanders game without him. It seems though the Ice Girls are no longer a thing. Yep, the ice crew was a co-ed, prison jumpsuit clad, shovel pushing blur. Maybe they have Santa suit jumpsuits in December, but they at least don't detract from the game. Right the game! I had no idea who half the players were. Yes, I've been away that long. Then again, some of them that were on the ice today may not be an Islander for too long. Guess I'll check everyone's blog or podcast to find out for now. The return of Matt Martin brought a collective roar from the crowd along with his starting line mates, Cal Clutterbuck and Casey Cizikas. The old "best fourth line in the NHL" started today's game, and we were delighted. Equally delighted when Clutterbuck scored a power play goal. Not delighted that Martin spent two minutes in the box. New Isles goalie, Robin Lehner received rousing applause and put on a good showing making 8 saves while Gibson, who played the second half made 9 in this shut out game over the Flyers. Matt Barzal was noticeable on the ice with his great skating ability, and did manage to earn an assist, but it was Kieffer Bellows who managed to get a mark in every column of the scoresheet today: a goal, an assist and two minutes in the box. Nice job kid. The third Isles goal was scored by Sebastian Aho. Like I said, I did a lot of "Who's that?" But a name I didn't even realize I didn't see today until a few minutes ago was Josh Bailey. Nope. Didn't even notice. Then again, I'm sure he hasn't missed me either. So there you have it. I went to a game, spent way too much money and actually wrote a blog. I had forgotten how long this actually takes me. But it was better than cleaning or doing actual work. Well Halle-frekin'-lujah. Over a decade ago I kept asking "Why not build in Suffolk County, Mr. Wang?" Suffolk seemed perfect. It had many parcels of available property that would have fit the needs of the Lighthouse project. Transportation, ease of access and a favorable political environment. But no. Uniondale was where he wanted to be. What was to be his legacy for his children is now just a once promising idea. For Nassau County that is. But here in Suffolk County the Ronkonkoma Hub project that has already broken ground seems eerily similar to me. The apartment complexes, the retail space, the restaurant space, the parking garages each brought back memories of that multipage postcard we all got with the concepts of the project. The only thing missing was that bubble of an arena and the much needed Sports Medical Arts building. Well, not any more. Across from that perfectly planned walking community will be exactly what was needed here in Suffolk; an entertainment and convention venue partnered with a world-class sports medicine facility and jobs. All within walking distance of a major LIRR station, along a bus route and at three exits of a major roadway. Give me an adorable trolley as was once proposed by the Islanders organization, and this is Disney-esque to a T! But the Islanders have NOTHING to do with this project according to Jim Baumbach from Newsday who says he is "in-the-know." From my past experience with the organization I can say -- they never tell the whole truth because they themselves aren't even sure of the entire truth. The truth is basically a moving target for them. So maybe they will have a new home in Suffolk, maybe not. Who knows. If they continue to play the way they have been, they can put in an ECHL team and it will be just as successful. Hell, put the Stony Brook SeaWolves in there. That's fine. The Islanders are the classic definition of insanity. Continue to do the same thing believing there will be a different outcome. 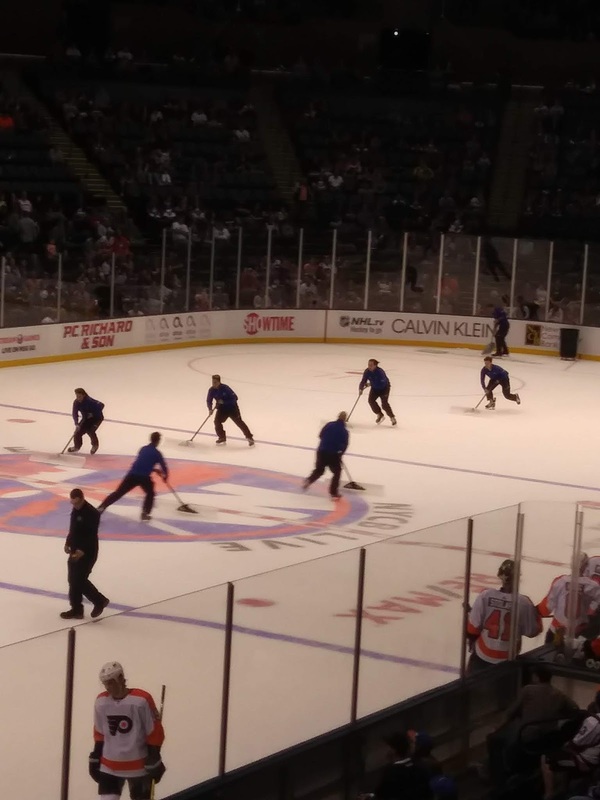 Will John Tavares stay long enough to see ANY new arena built for them, wherever it may be? Not sure. But certainly the Islanders have done nothing for him in years other than grant him protection from a Canadian media spotlight and basketball in Charles Wang's driveway. If John Tavares truly wants to have his name etched on the Stanley Cup, it is time for him to move on. And speaking of moving on, Garth Snow can't possibly be happy with himself or his organization. He has nothing to show for his tenure as GM other than mediocrity. Time to find a new beginning for him as well. But don't be surprised if things stay the way they are. This is after all The Islanders. No matter who "owns" them, they manage to always stay pretty much the same: A work in progress. Sort of like the Sistine Chapel. Suffolk County: What About Us? So last night I ventured out to a function much like ones I had visited years ago. A public display of proposals for improvement of our region by prominent engineers, designers and investors. Each group looking to come up with a plan that would enhance the already approved Ronkonkoma Hub development. You see in Suffolk, we STILL have large parcels of undeveloped land. Although when looking at the very impressive model of the final Ronkonkoma Hub plan with it's beautiful street arches, spired center piece, 14,500 residential units, restaurant and retail space, I was left shocked when I asked how many acres the magnificent project was occupying. It's about five to six acres. THAT'S IT. Even more shocking? The density is less than that of the Patchogue redevelopment which we know has done wonders for that downtown area. Yes, Bay Shore and Patchogue have been turned around in my lifetime. I didn't expect it. But there they are. Trendy, cool destinations well designed with the next generation in mind. But I digress. 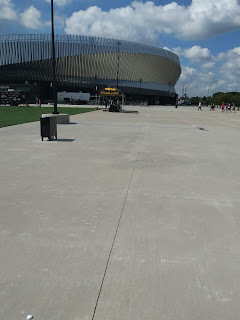 So now Suffolk has turned it's eyes (for the past few years) to the next project area; the large swath of property by the Ronkonkoma train station that would be on the other side of the Hub. But what to do with it? One plan proposed was to mirror the development with MORE residential units and offices. That plan left me shaking my head. Too big. Too much. Another plan had three different concepts that seemed like someone took out Legos and just tried to see what fit together. I wasn't that impressed. But for me, one project possibility stood out because it seemed so desirable, so perfectly complimentary, so .... so... familiar. The key project elements that the Ronkonkoma Vision Project, LLC presented last night were all the things so many of us wanted to see for Long Island in Nassau County. A new convention center, a sports Medicine center, a cultural center and a 17,500 seat entertainment arena. WHAAAATTTTT????? 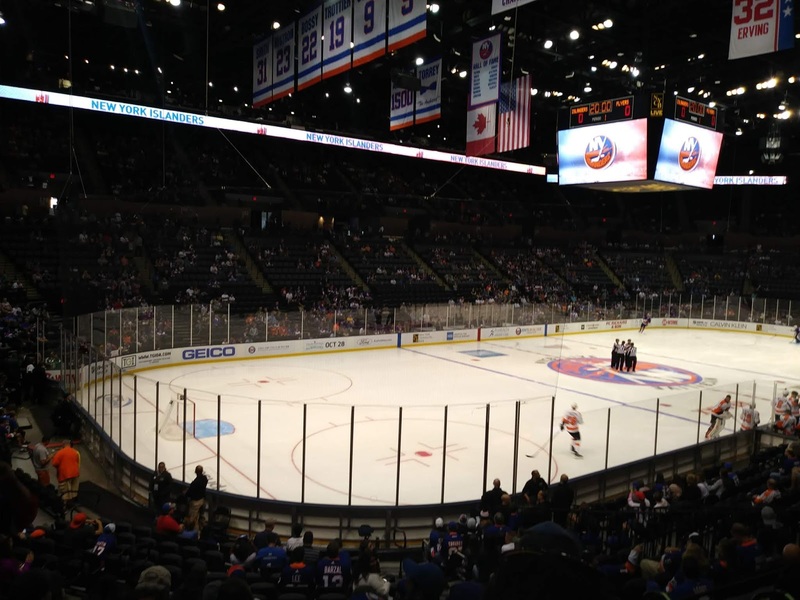 An NHL size arena in Suffolk County? Within walking distance to a railway? Within a stone's throw of an airport? Be still my heart!!! But there it was. A rendering of a rounded out rectangle that looks like Tupperware but would house ICE. NHL ICE. And as an added bonus, more ice for the public and for practice facilities. I immediately thought of what I had seen in Columbus and New Jersey. Why you may ask? Why not I counter. 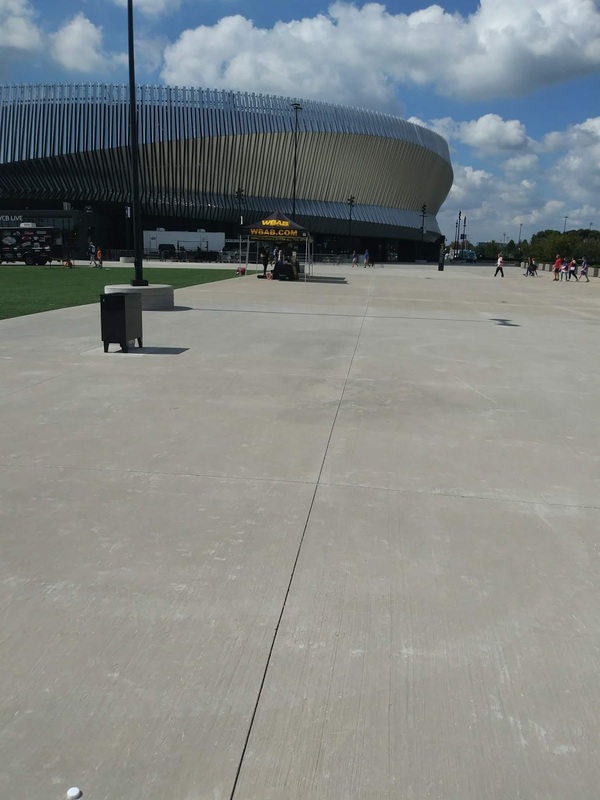 Why was Suffolk County never in the mix for a new home for the ONE professional sports team in the region? WHY? So, why not? Would finding a new home in Suffolk have been better than the Brooklyn experiment? I believe so. Would Suffolk work better than the Belmont proposal? For me, oh hell yeah! Even though right now the Islanders are like an estranged ex-husband. I still have feelings, but they just annoy me. But maybe I could love again. If this project proposal is chosen for the development of the area, it has impressive members: JLL, Spectra (Comcast), HRA Rubenstein, Cameron Engineering. Photos of past, profitable, projects are impressive. If I can get my phone to work, maybe I'll be able to share some!